In collaboration with the Einstein Forum. 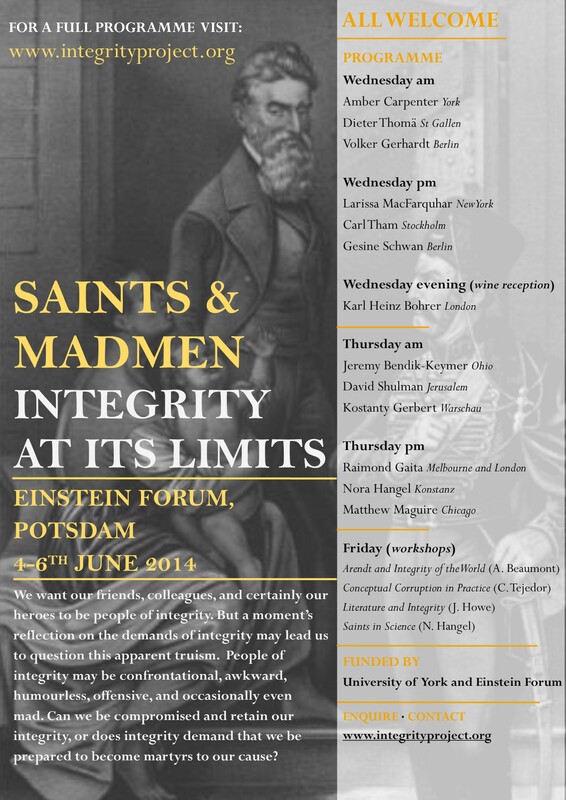 ‘Saints and Madmen: Integrity at its Limits’ asks whether, or in what way, integrity demands purity and uncompromising adherence to values. We want to look at, on the one hand, what it does to a person to hold themselves to a high standard, and how real integrity can look to people from the outside (sometimes foolish or inconsiderate or vain); and we want to look, on the other hand, and what it does to people to be held to some ‘saintly’ version of absolute integrity, such that everyone is already compromised anyway. Can we be compromised, hypocritical, and prudential and still be persons of integrity or does, after all, integrity demand that we are prepared to become martyrs to a cause? On days one and two we will hear papers from a number of high-profile international speakers. Day three will be a day of smaller workshops; we are keen to hear from people who want to be involved. In keeping with The Integrity Project’s aims, we will bring together academics from across the disciplines, as well as those living and working in circumstances which compromise or enable integrity. Click on the paper titles to be taken to audio and transcript (where available). Full programme details will be announced shortly. All enquiries to contact@integrityproject.org.